Is it really an eftpos gift card if it’s not covered in tiny images of gifts? The answer is “yes”, obviously. We’ll let you in on a secret: this card might just be a better gift than almost anything that comes in a box. It’s the gift that can be whatever they want it to be. And here’s another sneaky benefit: you don’t even have to wrap this gift. We can handle everything to do with presentation, whether you’d prefer a simple envelope or a fully-branded (and matching) eftpos gift card wallet. This card is popular year round, but it enjoys a particular upsurge around Christmas: it’s a little bit festive after all. 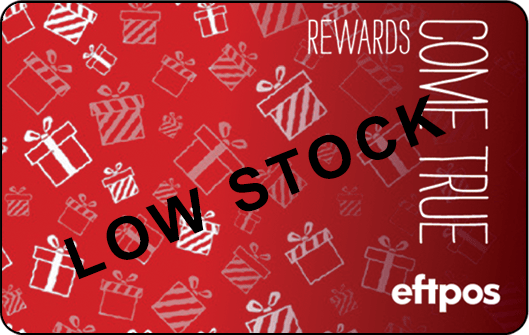 Be sure to get your order soon: it’s one of the most-ordered cards and stock doesn’t last long.